Manchester/Frankfurt/Copenhagen – The Thomas Cook Group Airline has increased its underlying profit by 37% to £129 million for the financial year ending September 30, 2018. With an increase of available seats of 8.8% and a fleet of 100 aircraft overall revenues have grown by 10.1% to £3.5bn in the financial year 2017/18. With the two brands Thomas Cook Airlines (in UK and Scandinavia) and Condor (in Germany), the Group Airline has carried over19 million passengers to over 120 destinations worldwide. Top Copyright Photo (all others by the airline): Condor Flugdienst-Thomas Cook Airbus A320-212 D-AICE (msn 894) PMI (Ton Jochems). Image: 944674. 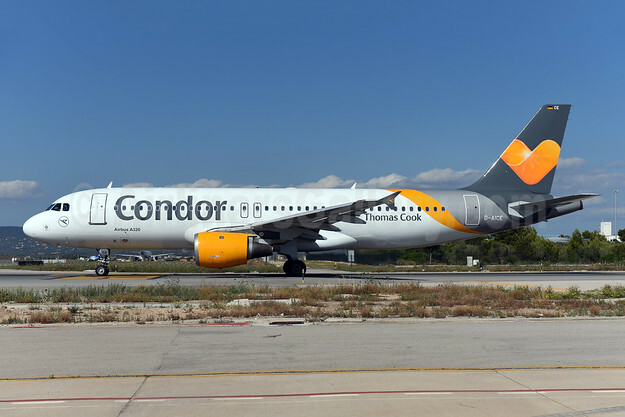 This entry was posted in Condor, Thomas Cook Airlines (UK), Thomas Cook Group and tagged Airbus A320-212, Condor Flugdienst-Thomas Cook, D-AICE, msn 894, Thomas Cook Airlines (UK), Thomas Cook Group on December 7, 2018 by Bruce Drum.